The Greek and Latin words which entered into the language of the Hebrews are transcribed in the Talmud, Midrash, and Targum according to purely phonetic principles, their etymologies being entirely disregarded. 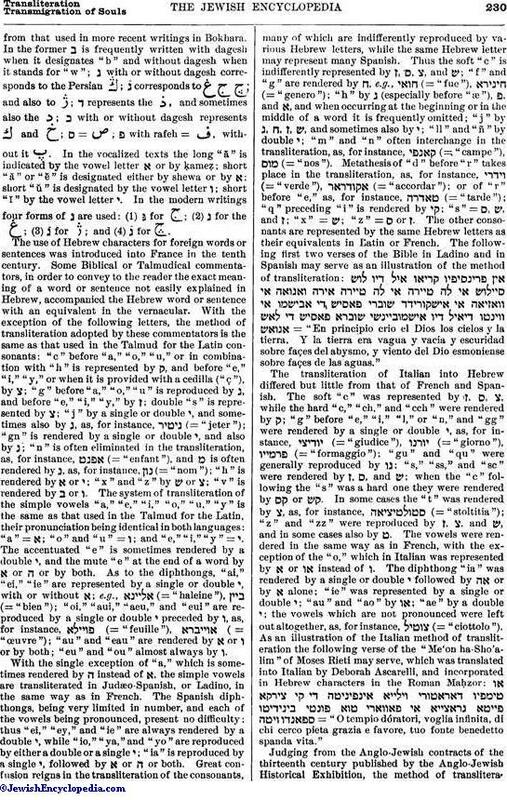 Besides the lack in Hebrew of that rich system of vocalization which characterizes the Latin, and especially the Greek, the alphabets of these languages include characters which are not represented in the Hebrew, and therefore their transliteration is attended with many complications; sometimes it is even very difficult to detect the root of the transcribed word. The Hebrew consonants represent the following Greek and Latin equivalents: ב = β or "b," π or "p," ψ or "f"; ג = γ, or "g" and sometimes also κ; ד = δ or "d"; ו = the Latin "v" and sometimes also β or "b"; ז = ζ or "z" and sometimes also σ; ח = χ; ט = θ and also τ or "t"; י = the Latin "j"; כ = χ and sometimes also κ; ל = λ or "l"; מ = μ or "m"; נ = ν or "n"; ע has no equivalent either in Greek or in Latin; פ = π or "p" and ψ or "f"; צ = σ; ק = κ or "k" and the Latin "q"; ר = ρ or "r"; ש = σ; ת = θ. The Greek double letters ξ and ψ are respectively represented by or , and by . The nasal sounds γγ, γκ, γχ are reproduced in a manner analogous to the Latin, Syriac, Arabic, etc., as, for instance, for ἀγγελος, for ἀνάγκη, for κόγχη. The Latin and Greek vowels are transcribed as follows: α by א, sometimes by ע or ה: ε or "e" by א, sometimes by ע or י; ι by א, , or י; ο by א, , or ו; η by or י, less frequently by ה; ω by or ו; αι (Latin "æ") by or י; ει by י; οι by א or י; αυ by , or ; ευ by , or ; ου (Latin "u") by or ו. The hiatus is always neglected, while both the spiritus asper and the spiritus lenis are scrupulously represented, the former by ה and the latter by א. The aspirated π is indicated by or ; even internal aspiration occurs, as, for instance, for συνέδριον. However, the vowels are not always kept intact, but are often interchanged contrary to the rule. Syllables are frequently elided by apocope, apheresis, and especially syncope. 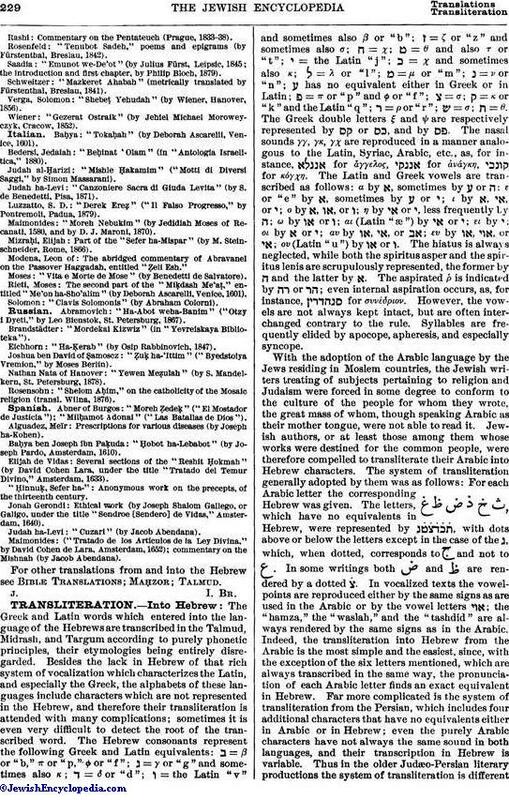 With the adoption of the Arabic language by the Jews residing in Moslem countries, the Jewish writers treating of subjects pertaining to religion and Judaism were forced in some degree to conform to the culture of the people for whom they wrote, the great mass of whom, though speaking Arabic as their mother tongue, were not able to read it. Jewish authors, or at least those among them whose works were destined for the common people, were therefore compelled to transliterate their Arabic into Hebrew characters. The system of transliteration generally adopted by them was as follows: For each Arabic letter the corresponding Hebrew was given. The letters, , which have no equivalents in Hebrew, were represented by , with dots above or below the letters except in the case of the נ, which, when dotted, corresponds to ج and not to غ. In some writings both ض and ظ are rendered by a dotted ע. In vocalized texts the vowel-points are reproduced either by the same signs as are used in the Arabic or by the vowel letters ; the "hamza," the "waslah," and the "tashdid" are always rendered by the same signs as in the Arabic. Indeed, the transliteration into Hebrew from the Arabic is the most simple and the easiest, since, with the exception of the six letters mentioned, which are always transcribed in the same way, the pronunciation of each Arabic letter finds an exact equivalent in Hebrew. Far more complicated is the system of transliteration from the Persian, which includes four additional characters that have no equivalents either in Arabic or in Hebrew; even the purely Arabic characters have not always the same sound in both languages, and their transcription in Hebrew is variable. Thus in the older Judæo-Persian literary productions the system of transliteration is differentfrom that used in more recent writings in Bokhara. In the former ב is frequently written with dagesh when it designates "b" and without dagesh when it stands for "w"; נ with or without dagesh corresponds to the Persian ڭ; corresponds to ; and also to ژ; ד represents the ذ, and sometimes also the ڊ; כ with or without dagesh represents ك and خ ; ס = ص; פ with rafeh = ف, without it پ. In the vocalized texts the long "ā" is indicated by the vowel letter א or by ḳameẓ; short "ǎ" or "ě" is designated either by shewa or by א; short "ǔ" is designated by the vowel letter ו; short "ǐ" by the vowel letter י. In the modern writings four forms of נ are used: (1) נּ for ج; (2) נ for the غ; (3) נּ for ژ; and (4) for ڇ. The use of Hebrew characters for foreign words or sentences was introduced into France in the tenth century. Some Biblical or Talmudical commentators, in order to convey to the reader the exact meaning of a word or sentence not easily explained in Hebrew, accompanied the Hebrew word or sentence with an equivalent in the vernacular. With the exception of the following letters, the method of transliteration adopted by these commentators is the same as that used in the Talmud for the Latin consonants: "c" before "a," "o," "u," or in combination with "h" is represented by ק, and before "e," "i," "y," or when it is provided with a cedilla ("ç"), by ע; "g" before "a," "o," "u" is reproduced by נ, and before "e," "i," "y," by ז; double "s" is represented by ע; "j" by a single or double י, and sometimes also by ג, as, for instance, (= "jeter"); "gn" is rendered by a single or double י, and also by נ; "n" is often eliminated in the transliteration, as, for instance, (= "enfant"), and מ is often rendered by נ, as, for instance, (= "nom"); "h" is rendered by א or י; "x" and "z" by ש or צ; "v" is rendered by ב or ו. The system of transliteration of the simple vowels "a," "e," "i," "o," "u," "y" is the same as that used in the Talmud for the Latin, their pronunciation being identical in both languages: "a" = א; "o" and "u" = ו; and "e," "i," "y" = י. The accentuated "e" is sometimes rendered by a double י, and the mute "e" at the end of a word by א or ה or by both. As to the diphthongs, "ai," "ei," "ie" are represented by a single or double י, with or without א; e.g., (= "haleine"), (= "bien"); "oi," "aui," "aeu," and "eui" are reproduced by a single or double י preceded by ו, as, for instance, (= "feuille"), (= "œuvre"); "au" and "eau" are rendered by א or ו or by both; "eu" and "ou" almost always by ו. With the single exception of "a," which is sometimes rendered by ה instead of א, the simple vowels are transliterated in Judæo-Spanish, or Ladino, in the same way as in French. The Spanish diphthongs, being very limited in number, and each of the vowels being pronounced, present no difficulty; thus "ei," "ey," and "ie" are always rendered by a double י, while "io," "ya," and "yo" are reproduced by either a double or a single י; "ia" is reproduced by a single י, followed by א or ה or both. Great confusion reigns in the transliteration of the consonants, many of which are indifferently reproduced by various Hebrew letters, while the same Hebrew letter may represent many Spanish. Thus the soft "c" is indifferently represented by ז, ם, צ, and ש; "f" and "g" are rendered by ח, e.g., (= "fue"), (= "genero"); "h" by נ (especially before "æ"), פ, and א, and when occurring at the beginning or in the middle of a word it is frequently omitted; "j" by , נ, ח, ז, ש, and sometimes also by י; "ll" and "ñ" by double י; "m" and "n" often interchange in the transliteration, as, for instance, (= "campe"), (= "nos"). Metathesis of "d" before "r" takes place in the transliteration, as, for instance, (= "verde"), (= "accordar"); or of "r" before "e," as, for instance, (= "tarde"); "q" preceding "i" is rendered by ; "s" = ס, ש, and ז; "x" = ש; "z" = ס or ז. The other consonants are represented by the same Hebrew letters as their equivalents in Latin or French. The following first two verses of the Bible in Ladino and in Spanish may serve as an illustration of the method of transliteration: = "En principio crio el Dios los cielos y la tierra. Y la tierra era vagua y vacia y escuridad sobre façes del abysmo, y viento del Dio esmoniense sobre façes de las aguas." The transliteration of Italian into Hebrew differed but little from that of French and Spanish. The soft "c" was represented by ז, ס, צ, while the hard "c," "ch," and "cch" were rendered by ק; "g" before "e," "i," "l," or "n," and "gg" were rendered by a single or double י, as, for instance, (= "giudice"), (= "giorno"), (= "formaggio"); "gu" and "qu" were generally reproduced by ; "s," "ss," and "sc" were rendered by ז, ס, and ש; when the "c" following the "s" was a hard one they were rendered by or . In some cases the "t" was rendered by צ, as, for instance, (= "stoltitia"); "z" and "zz" were reproduced by ז, צ, and ש, and in some cases also by ט. The vowels were rendered in the same way as in French, with the exception of the "o," which in Italian was represented by א or instead of ו. The diphthong "ia" was rendered by a single or double י followed by or by א alone; "ie" was represented by a single or double י; "au" and "ao" by ; "ae" by a double י; the vowels which are not pronounced were left out altogether, as, for instance, (= "ciottolo"). As an illustration of the Italian method of transliteration the following verse of the "Me'on ha-Sho'alim" of Moses Rieti may serve, which was translated into Italian by Deborah Ascarelli, and incorporated in Hebrew characters in the Roman Maḥzor: = "O tempio dóratori, voglia infinita, di chi cerco pieta grazia e favore, tuo fonte benedetto spanda vita." Judging from the Anglo-Jewish contracts of the thirteenth century published by the Anglo-Jewish Historical Exhibition, the method of transliterationinto Hebrew from the English differed from the French or Italian only in those consonants and vowels which have a special pronunciation. The soft "c" was represented by צ or ש; "ch" by ק or צ; "j" and the soft "g" by a single or double י; "s" or "ss" by ש, צ, or ז; "th" by ז, , or , followed by ש or צ; "v" by װ or . כּ sometimes stands for ק; תּ for ט; ב (rafeh) for ו; and נ for מ. The simple vowels were transcribed in the same way as the French; as to the diphthongs, "ai" and "ay" were rendered by double י; "au" and "ou" by ו, , or א; "ea" and "ee" by a single י; "ei" by a single or double ו; "ia," "ie," and "ey" by a double or single י followed by א or ה or both; "oi" and "oy" by ; "ew" by or by ו. In the transliteration of the numerous English words which entered the Judæo-German in the English-speaking countries, the pronunciation was faithfully preserved. The hard "c," "ch," and "q" are represented by ק, while the soft "c" is rendered by צ; the "f" and "p" are both rendered by פ, with the only difference that for the former the פ is rafeh, while for the latter it is with a dagesh; the soft "g" is represented by ; the "j" by ; "s" or "ss" by א; "t" by ט, and before "ion" by ש; "th" by ; "v" by ב (rafeh) or ו; "w" by װ or . According to the English pronunciation, the "a" is represented by א or ײ; the "e" by ע or י; the "i" by י or ; the "o" by ו; the "u" by ו or א. In the transliteration of the diphthongs the vowels that are not pronounced are left out altogether. 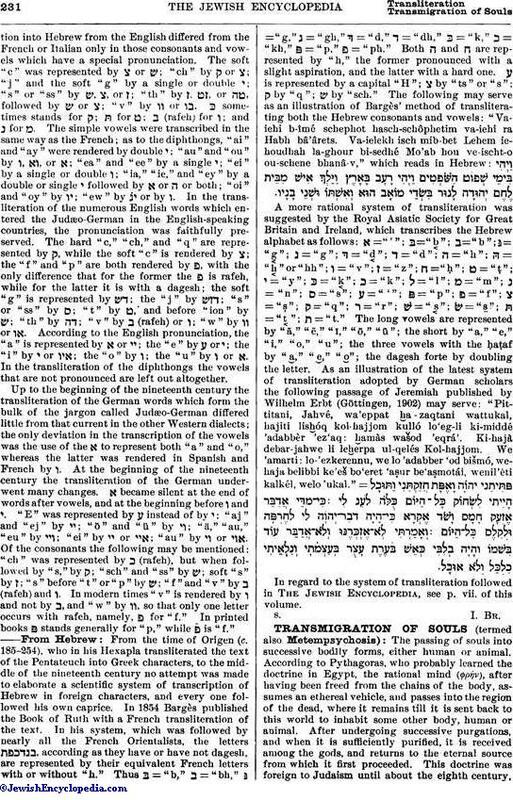 Up to the beginning of the nineteenth century the transliteration of the German words which form the bulk of the jargon called Judæo-German differed little from that current in the other Western dialects; the only deviation in the transcription of the vowels was the use of the א to represent both "a" and "o," whereas the latter was rendered in Spanish and French by ו. At the beginning of the nineteenth century the transliteration of the German underwent many changes. א became silent at the end of words after vowels, and at the beginning before ו and י. "E" was represented by ע instead of by י; "aj" and "ej" by ײ; "ö" and "ü" by ױ; "ä," "au," "eu" by ; "ei" by ײ or ; "au" by ױ or . Of the consonants the following may be mentioned: "ch" was represented by כ (rafeh), but when followed by "s," by ק; "sch" and "ss" by ש; soft "s" by ז; "s" before "t" or "p" by ש; "f" and "v" by ב (rafeh) and ו. In modern times "v" is rendered by ו and not by ב, and "w" by װ, so that only one letter occurs with rafeh, namely, פ for "f." In printed books פּ stands generally for "p," while is "f."
In regard to the system of transliteration followed in The Jewish Encyclopedia, see p. vii. of this volume.